Need a better way to prevent slip and fall accidents at your facility? This Master Stop Extreme Tape is a great way to do just that. These strips are designed to withstand extreme weather and a broad range of temperatures, ranging from -40°F to 220°F. Available in both coarse and standard, Extreme Tape strips are manufactured with multiple layers of grit. This means they will outlast standard grit tapes! Master Stop Extreme tape is recommended for any heavy-traffic area where extra traction is needed and safety is a top priority. These areas include, but are not limited to, bleachers, ramps, stairs, and loading docks. Installation is quick and easy! 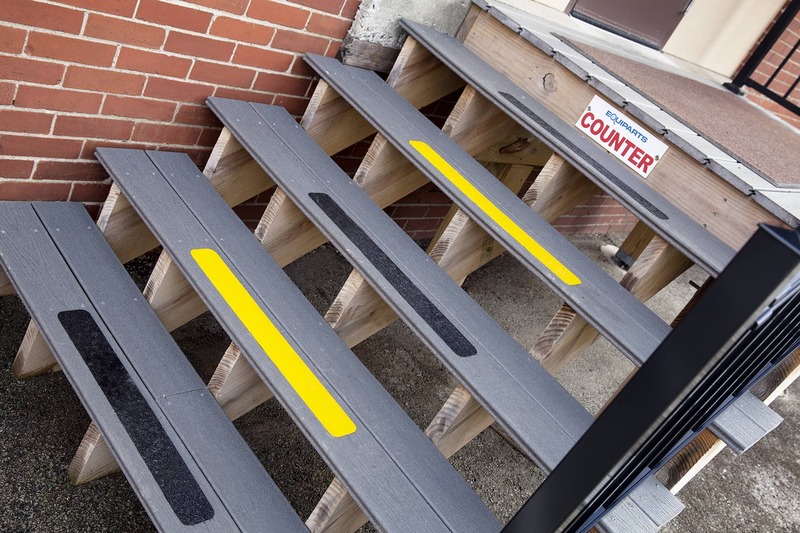 Watch how quickly we installed it on the counter steps at Equiparts in our video above. Once the surface is clean and dry, just peel off the adhesive backing and press down. Once applied, Extreme Tape is long-lasting and tolerant of oil and grease, saltwater, and mild acid. The adhesive is three times stronger than standard anti-slip tapes. Master Stop Extreme Tape is made in the United States and exceeds recommendations by OSHA and ADA for Coefficient of Friction. Call to order Master Stop Extreme Tape at Monday-Friday 800-442-6622, 7:30AM-5:00PM EST. Be sure to mention the EC Part numbers mentioned above when placing your order. Save/share the Extreme Tape Promo PDF with your colleagues.